A new video recently released on Evan Blass’ Twitter account appears to show a foldable device, allegedly manufactured by Xiaomi, in action. The well-known tipster isn’t himself sure of the video’s veracity, but it has been garnering a considerable amount of comments from excited viewers. Fake or not, it certainly offers an enticing glimpse into one of 2019’s hottest technologies. Well-regarded tech insider Evan Blass has uploaded a video to his Twitter account that has created something of a buzz among viewers. The 20-second clip shows someone using an indiscernible device to browse through apps before selecting Google Maps. 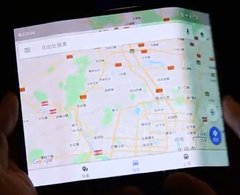 After a quick check on a location, the user casually folds the right side and then the left side of the device backwards and behind the central third, leaving a smartphone-like display. Google Maps is then swiped off the screen to show that the apps have now been seamlessly rearranged to fit the re-sized panel. Judging by some of the comments the clip has received already it seems many believe the foldable device is an actual working handset, possibly made by Xiaomi, rather than just a crafty piece of fakery. There are many hoping that the Chinese manufacturer is going to be quick on the foldable bandwagon, as the expected high cost of Samsung’s upcoming effort will price many consumers out of a potential purchase. Xiaomi is renowned for releasing decent products with great hardware for a fraction of the cost of its rivals, and it’s likely the same pricing philosophy would be applied to a foldable device. A few Tweeters have pointed out that the user interface on show looks like Xiaomi’s MIUI firmware. Obviously, the fact that the video has been shot in almost total darkness has made some people suspicious about the device, including the possibility that if it is a genuine Xiaomi foldable phone/tablet then it’s likely there are parts of it the manufacturer doesn’t want to show off just yet. However, there’s no doubt about the general positive reception that the clip has been greeted with.